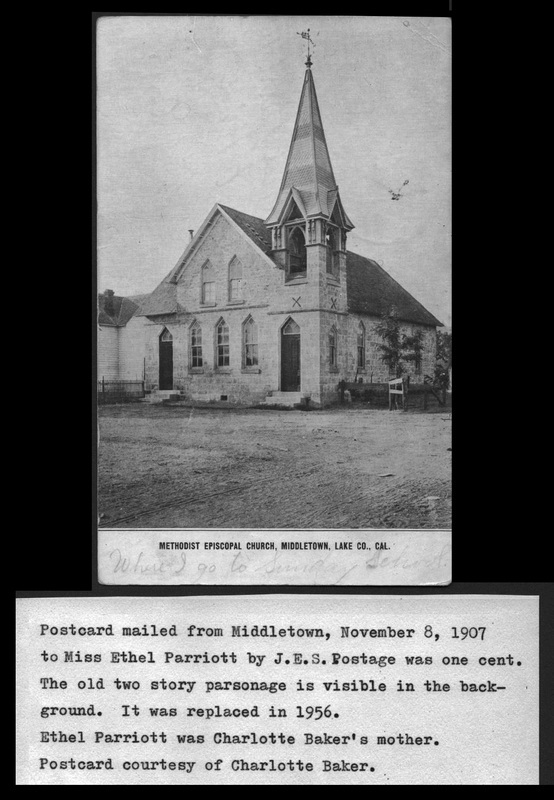 Not long after homes and shops started going up in the new streets of Middletown, a church was built in late 1870 or early 1871. The modest frame building, typical of the time, served the growing population as a Presbyterian church for over a decade. The church had actually been organized in Coyote Valley several years earlier. Family history tells us that two sisters of John Henry Berry, who built the first house in Middletown, were the founders. 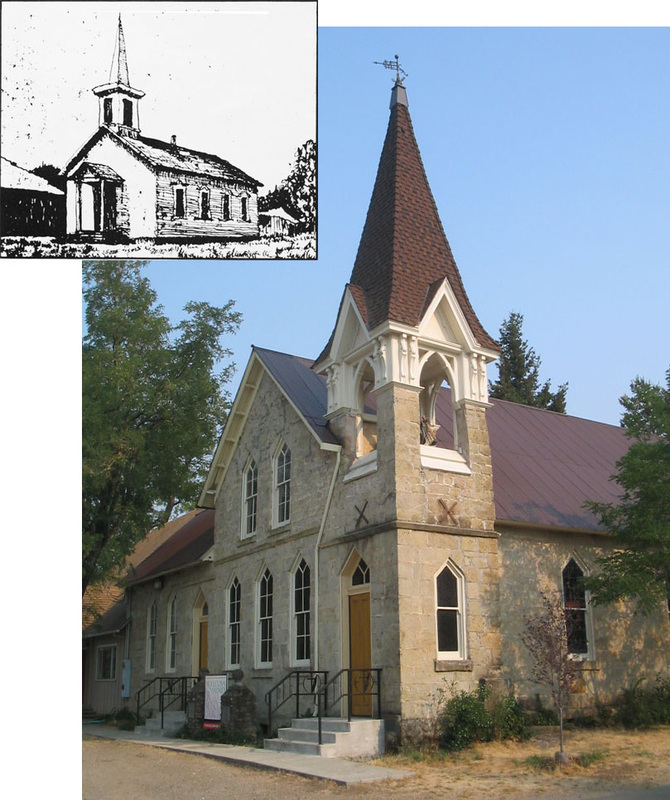 "On November 16, 1867, she and her sister, Mrs. Lutitia Berry Young, and several other residents of Coyote Valley met at the Old Stone House, now the home on the Young ranch, and organized the Cumberland Presbyterian Church. This organization was moved to Middletown in 1871, where it has combined to function until the present time. It is a part of the Federated and Community church." A photo in the collection of Mike Read, a descendant of a family that settled in Middletown in its earliest years, has a notation on its back that it is "the first minister," but no name. Edward Read, became minister of the church in 1884. The sketch in the upper left corner of the new community's first church, a modest frame building, was done by Rev. James Haggerty, for the 100th anniversary of Middletown in 1971. The building now occupied by the Middletown Community United Methodist Church was built of stone quarried near Bradford Mine, starting in 1894 and completed in 1897. Mrs. Farmer, both Samuel Farmer and C. William Farmer are in the Register of Voters, but not listed in the 1890 census. Mrs. Farmer had the building put on rollers and pulled by teams of horses to a location at the southern tip of town. The operation took about a week. The Middletown chapter of the Native Daughters of the Golden West, then the only chapter in Lake County, installed a bronze plaque on the old house in honor of its history. The house was razed a decade or so ago and the plaque moved to the existing stone church. The church has been a favorite with photographers since its earliest days, witness this postcard mailed to Ethel Parriott in 1907.